Throughout the past century, science and technology have melded together in Mount Revelstoke and Glacier national parks under the banner of stewardship and conservation. The value of these parks is much more than the sum of their parts; vast amounts of monitoring and research have been conducted by both Parks staff and external scientists, on topics varying from bear and wolverine genetics, snow and avalanche science, archeology, social sciences, changes in the regional landscape, to the identification of new insect species. Mount Revelstoke and Glacier national parks (MRGNP) are not only places of science and research, but also of inspiration, exploration and continual learning. Research, conducted by parks staff and outside academia improves knowledge of natural resources both inside and outside of park boundaries. Ecological integrity monitoring programs provide insight into how systems and resources within parks change over time. Both activities lead to a better understanding of ecological and cultural resources and contribute to goals of ensuring that our protected places are enjoyed in ways that leave them unimpaired for present and future generations. In 2005, the MRGNP field unit called for an ecological integrity monitoring program to assess change in the condition of ecosystems over time. Research and monitoring programs are essential components of managing and protecting ecosystems. However, small parks such as MRGNP, also need to work with their neighbors and partners to ensure that studies contribute to ecological knowledge within the greater North Columbia ecosystem. 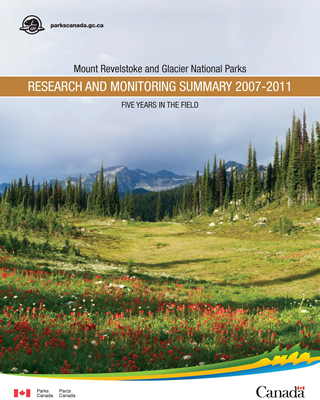 This report provides summaries of the research and monitoring activities conducted in Mount Revelstoke and Glacier national parks between the periods of 2007 – 2011. Summaries were compiled from research permits and park monitoring projects, and subsequently reviewed and updated by the lead researcher(s). Efforts were made to be as comprehensive as possible. The report is intended for use as a reference and communication tool for managers, partners, stakeholders, and parks staff. Information collected for this report will also serve to provide a strong foundation on which to build the Field Unit’s State of the Park summaries. Enjoy the fruits resultant from five years of science in the field! CMI thanks Parks Canada for their financial support which help to sustain our general operations, and provide valuable resources such as this.